Nuru means light in Tanzania’s native Swahili language. This is the goal of our Project: To bring light into the lives of physically handicapped people. In the Tanzanian culture people with physical handicaps are often pushed aside. These people have to rely on their families. However, they are mostly a burden for their families. As a project, we want to give people hope, to show them that they are precious in God’s eyes. Through this they can learn their strengths and create utility and decorative items which can then be sold, so that their salary can be paid. Our workshop is found just off the Bagamoyo Road in Mbezi Beach in the North of Dar es Salaam. 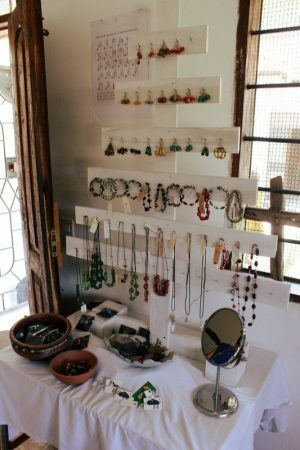 You will also find us at several artisan markets throughout the year in Dar es Salaam. Our range of products has grown from simple beaded necklaces to a wide variety of products using resources we get locally. We are able to customize many of our products such as shoes, signs, clocks, beaded jewelry and much more. Take a look at our whole range of products at our website here. If you have an event coming up and want to send guests home with a little token or you want to have a supply of little gifts for friends, we’d love to hear from you! If you would like to place a bulk order; please contact us to discuss your requests and ideas.